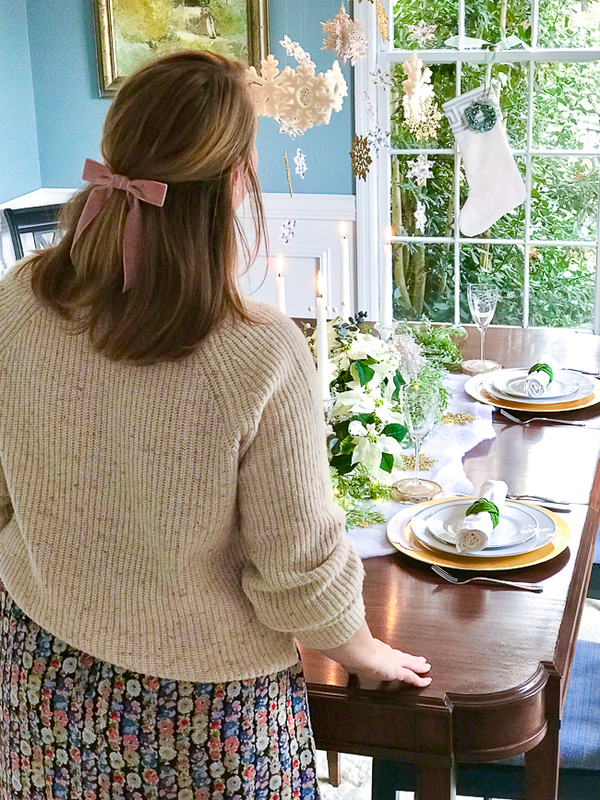 Celebrate the beauty of the frosted forest with this winter tablescape tutorial for a woodsy table setting that plays up winter’s magic for post holiday entertaining. The hustle and bustle of the holidays may be over, but that doesn’t mean all the glistening snowflakes and pretty evergreen has to get boxed up! 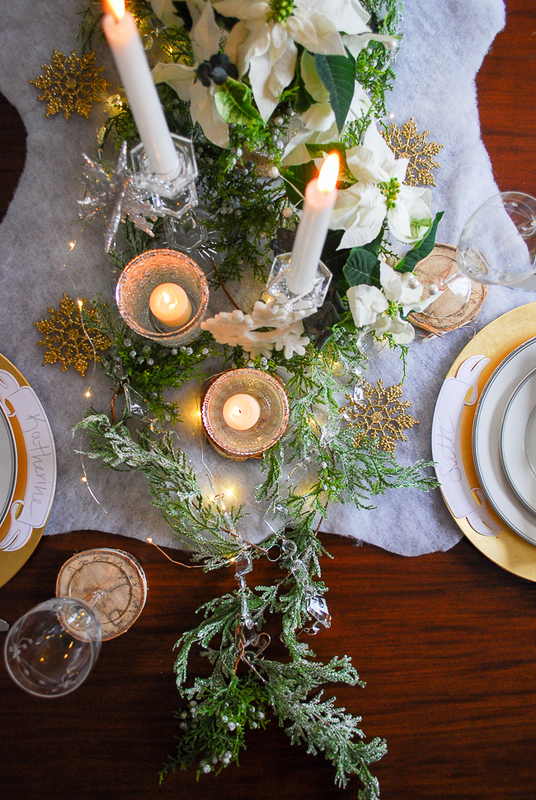 Set a beautiful winter tablescape to cozy up your home for the cold and blustery months ahead. 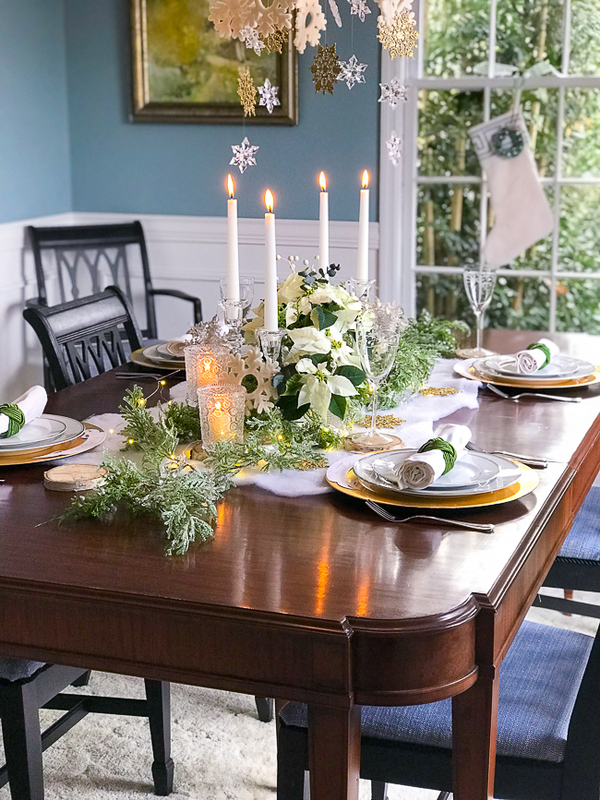 Invite friends and family over for a hearty meal and carry a little of that holiday magic into January with this woodsy table setting to celebrate the start of a new year and the beauty of winter. 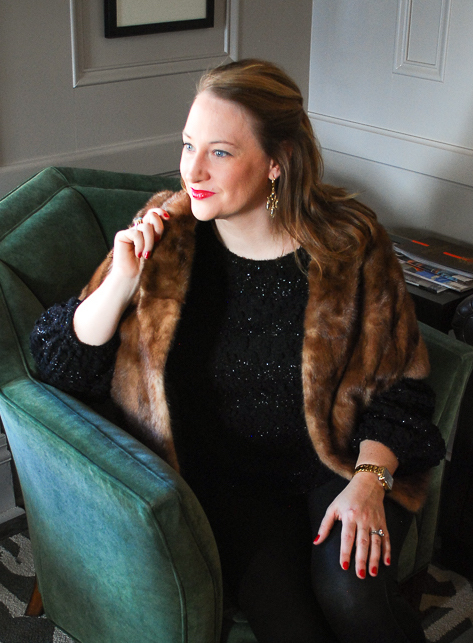 Nothing cures the winter blues like an intimate dinner party with brilliant conversation, laughter, and good food. 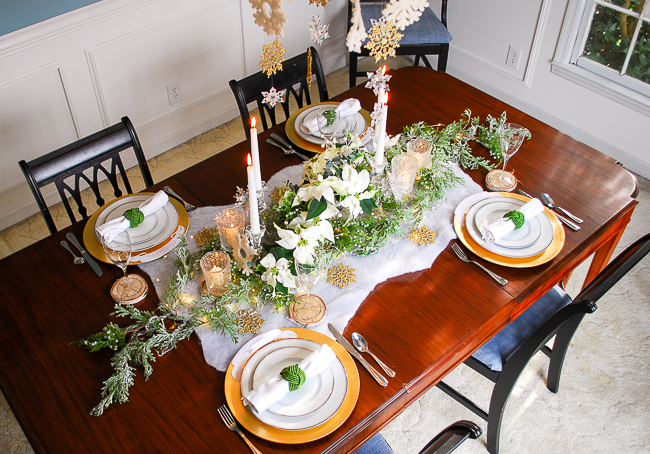 So host a winter themed dinner party and set the table with glistening snowflakes, white poinsettia, twinkle lights and candles, a blanket of snow, and evergreen garland. This frosted forest tablescape will enchant guests and set a celebratory mood. Let me show you how to create this woodsy table setting! My inspiration for this winter tablescape tutorial really started in 2017 when I was inspired by the winter botanical look. 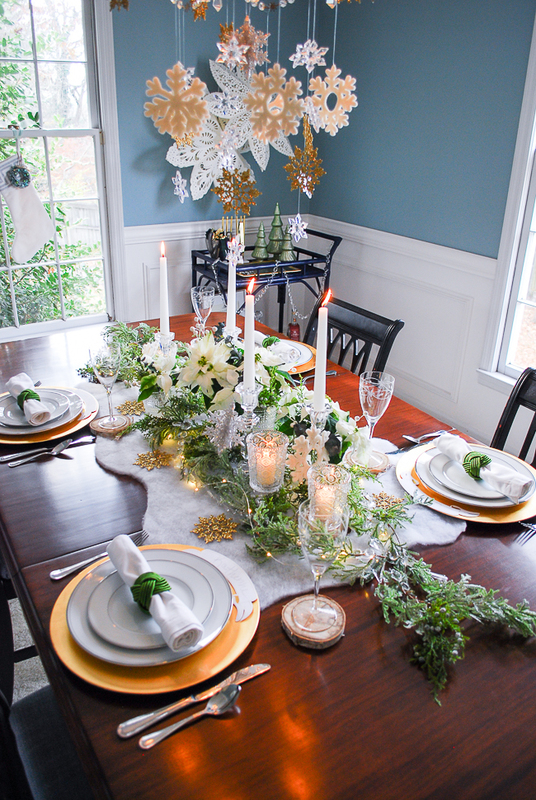 For this tablescape, I wanted to take that inspiration further to reflect the glistening beauty of a forest laden with ice crystals and snow with evergreen brilliant against the white. So here we are at a frosted forest tablescape! 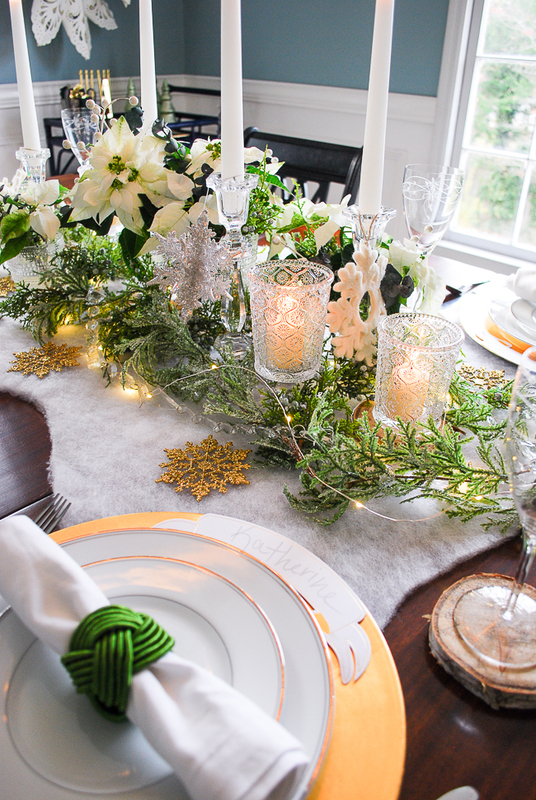 A color scheme of white, gold, silver, and brilliant green sets the stage for an elegant, romantic table that celebrates the beauty of winter. 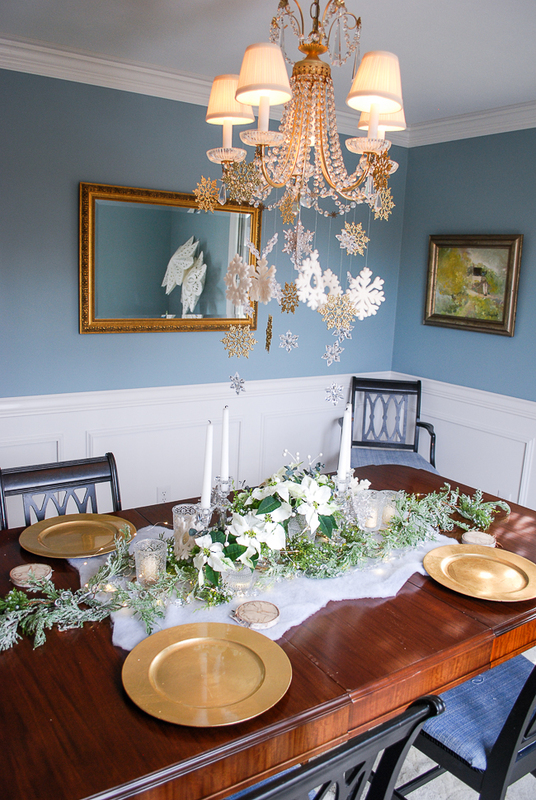 The snowflake cascade from the chandelier literally extends the tablescape upwards making it feel more like a frosted forest atmosphere. It adds drama and whimsy, while the flickering candlelight and twinkle lights nestled in the “snow” create a warm glow. Dinner party tables do not need to be this elaborate, but sometimes, especially during the bleaker months of winter, it is necessary to let your imagination run wild — to be playful and go that extra mile! I’ve included affiliate links below to the tableware and decorations I used in this frosted forest table or to similar decorations. 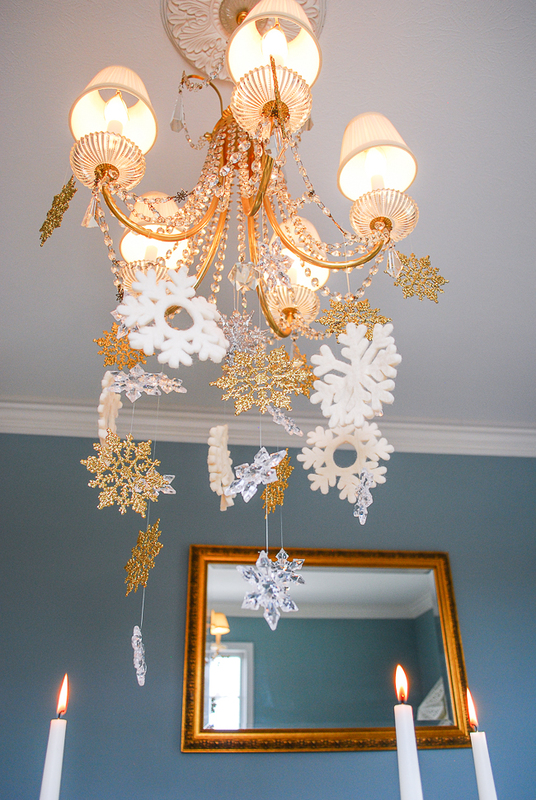 First, create your snowflake cascade from the chandelier. You will need clear fishing line and a variety of snowflakes. I used Christmas tree ornaments for my snowflakes with three different styles: gold glitter, clear, and white felt. Cut a piece of fishing line about 2 feet long, depending on how far down you want the snowflakes to hang. Simply loop the line through the hole in the top of the snowflake. Only tie the bottom flake, leaving the others looped so that you can adjust them up and down the line. 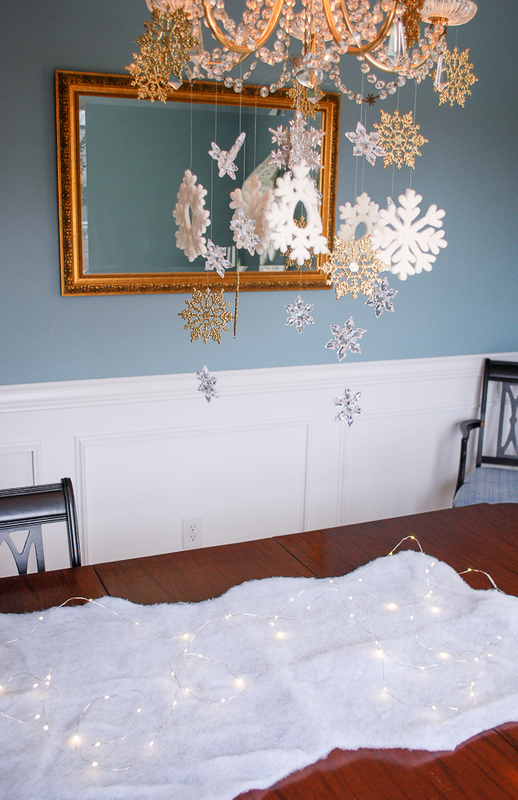 Hang your strings of snowflakes from your light fixture above the table. I hung mine at varying lengths and with different patterns of snowflakes. Once I had them all adjusted, I came back and clipped off the extra line. Second, lay down the blanket of snow and twinkle lights. I used quilt batting to create my snow. You could also use a white table runner or cotton wadding – anything white and fluffy that looks like snow! Twirl the twinkle lights around on the batting and tuck the battery box underneath. Third, place two garlands of frosted faux cedar and a two chains of crystals down on the snow. 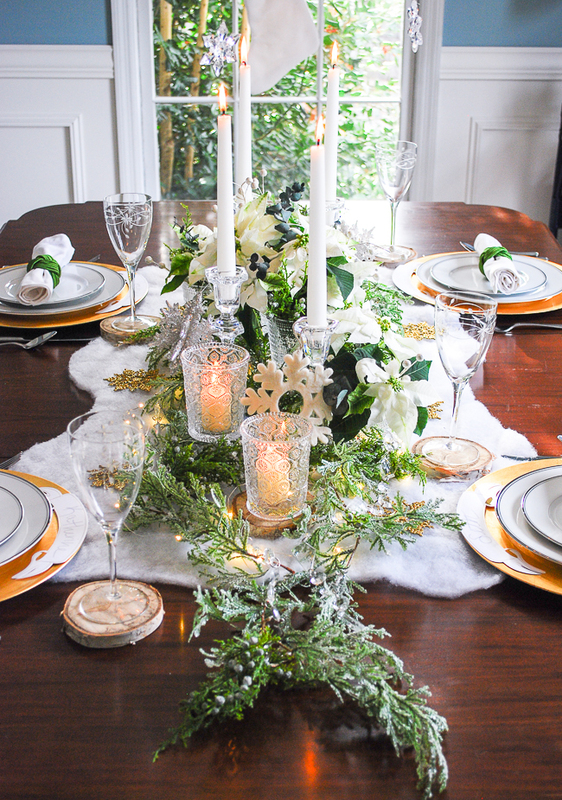 Then place tall candles and a variety of clear glasses down the center of the table, nestling the bases in the garland. I used 8 glasses in various sizes and shapes. Pull up the twinkle lights and garland around the glasses, so that they sit evenly. Fill the center glasses with water for floral arrangements and the outer glasses with votive candles. Fourth, create floral arrangements in several of the glasses. I used white poinsettia, faux juniper sprigs, eucalyptus, and white faux berries in four of my glasses. Be careful when clipping poinsettia as the stems leak a milky fluid. If you can’t find any white poinsettia, use white roses or tulips. Either of these flowers would look stunning on this frosted forest table. 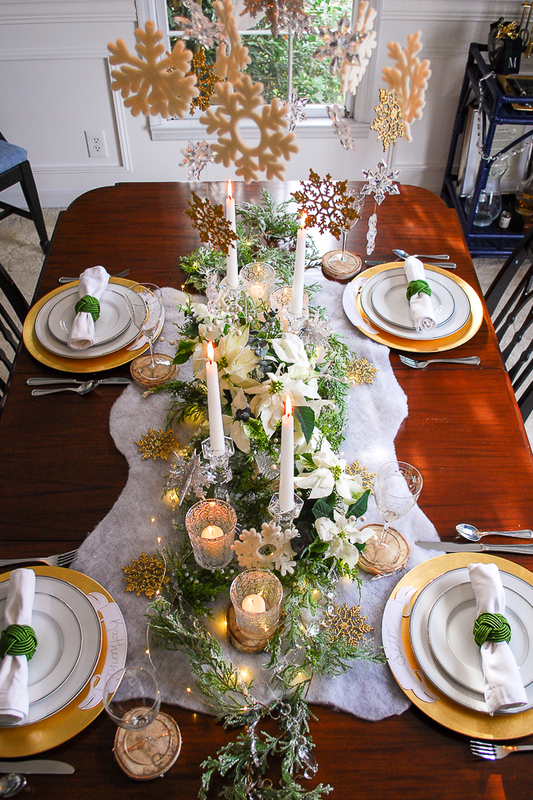 Fifth, set the table with white, gold, and silver chargers, dishes, and linens. 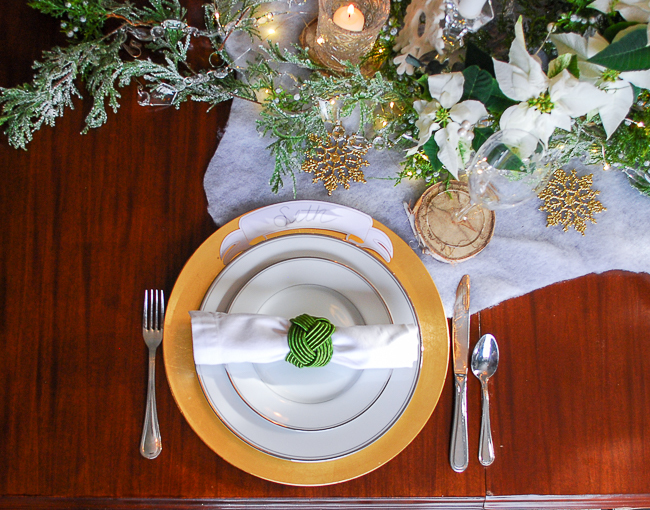 I used a gold plastic charger, white and silver china, white napkins, and green napkin rings for my place settings. Any mixture of these colors in the tableware you own would look great on this winter tablescape. To play up the woodsy feel, I used birch slices for the coasters. Finally, add the finishing touches. 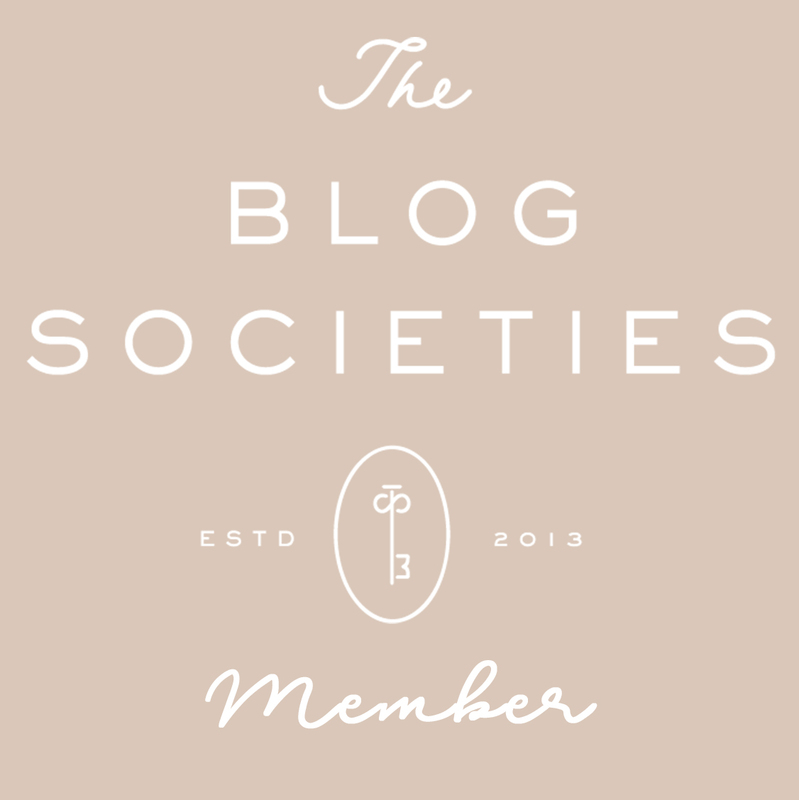 Write the place cards and adjust the florals. Light the candles just before you expect your guests to arrive! Open a bottle of wine and settle in for a cozy evening at home with this frosted forest table! 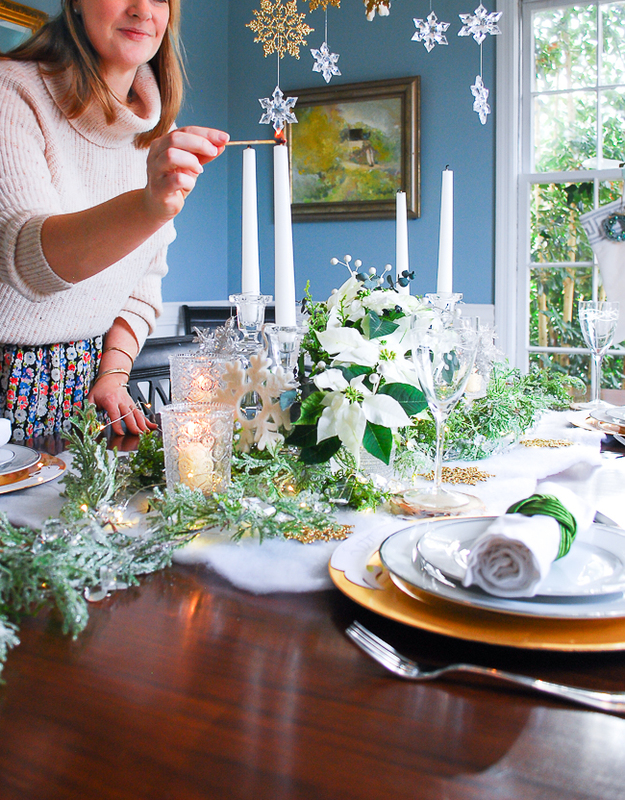 I hope you’ve found my winter tablescape tutorial useful and inspiring.